Imagine the M*A*S*H tent without the camouflage, place it at 17,500 feet, staff it with the best high-altitude physicians in the world (who volunteer their time), and you’ve got Everest ER. It’s been a busy week for Dr. Peter Hackett, the man who wrote “Mountain Sickness,” the Bible of high-altitude physiology, and Dr. Steven Halvorson, an emergency department physician at St. James Hospital in Butte, Montana. Today a trekker tumbled off a steep ridge between the outpost of Gorak Shep and Base Camp, did three somersaults, and smashed up his nose and face. Yesterday a patient suffering from “Transient Ischemic Attack” (minor stroke-like symptoms), was evacuated down valley by helicopter, and earlier this week Hackett and Halvorson, along with a few expedition leaders, led a high-altitude educational seminar for 40 Sherpas. The roomy white tent with two comfortable cots, Asian rugs on the floor, and stethoscopes hanging from the metal poles is the beating pulse of Base Camp. If a climber comes down with the Khumbu cough (a relatively harmless inflammation of the bronchial tubes), diarrhea, hemorrhoids, headaches, or far more serious ailments like High Altitude Pulmonary Edema (HAPE) or High Altitude Cerebral Edema (HACE), he or she heads to the ER. The clinic is a boon to climbers, but Bozeman, Montana-based founder, Dr. Luanne Freer, started the ER in 2003 with the intention to provide quality healthcare for the Sherpas and porters who risk their lives working on Mount Everest. The non-profit clinic, which receives no money from the Nepali government, is funded in large part by private donations and expeditions, which pay $100 per client for use of the ER during the duration of the expedition. The fee buys unlimited access to physician visits (medications cost roughly $20 extra) and allows the expedition Sherpas and porters to use the Everest ER free of charge. Any Sherpa or porter not involved in an expedition pays a visitation fee of 200 rupees, roughly the price of a cup of tea. 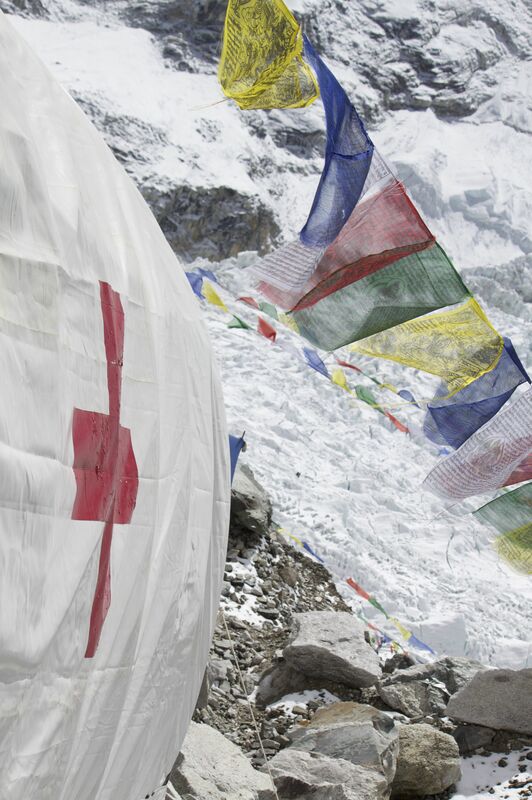 So far this season Everest ER has seen roughly 375 patients; 50 percent Sherpa, 50 percent Westerners. To help the cause, Hanesbrands, Inc. printed 1,000 t-shirts with a cool Everest ER logo, hauled them in 22 duffels to Base Camp on yaks, then gave them to Freer to use in a fundraising effort. The T-shirts are the hottest item in Base Camp this year. Dr. Hackett, who lived in Nepal for seven years as the medical director of the Himalayan Rescue Association and wrote “Mountain Sickness” in 1980, has seen new advances in the treatment of high-altitude sicknesses, but he still posits that the best way to prevent the most serious ailment, high-altitude pulmonary edema, is descent and oxygen. Even with education and the evolution of treatments there are some issues that crop up at Base Camp that even Everest ER can’t fix.